Vosaroxin, is a first-in-class anti-cancer quinolone derived (AQD) DNA topoisomerase II inhibitor currently under evaluation for the treatment of pts with AML and high-risk MDS. To determine the overall response rate including complete response (CR) + CR without platelet recovery (CRp) + CR with insufficient hematological recovery (CRi), safety and early mortality of vosaroxin and decitabine in newly diagnosed older pts with AML. Pts were eligible if they had untreated AML or high-risk MDS (≥ 10% blasts), were 60 years of age or older, had adequate performance status (ECOG ≤ 2) and organ function. In the phase I the first six pts received vosaroxin 90 mg/m2 daily on Days 1 and 4 with decitabine 20 mg/m2 daily for 5 days repeated in approximately 4 to 5 week intervals for up to 7 cycles. This dose was well tolerated in the 6 pts. However, due to occurrence of 8 episodes of grade 3/4 mucositis in the subsequent 16 pts the induction dose of vosaroxin was reduced to 70 mg/m2. 40 subsequent pts received vosaroxin 70mg/m2 in induction.. 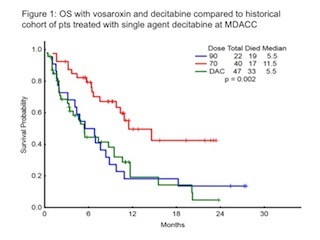 Combination of vosaroxin and decitabine is effective in older pts with AML and high-risk MDS. The lower dose of vosaroxin 70 mg/m2 on days 1 and 4 is associated with improved outcomes.